The Insider recently participated in the Aging Workforce Summit, a meeting of the minds focused on retirement in America. The conference took place on the 80th floor of the Aon Center in Chicago. The views of Chicago and Lake Michigan were supposed to be spectacular, but for the duration of the conference the building was socked in a fog, so all you could see from the windows was an indeterminate white haze – rather appropriate, given the foggy futures confronting a huge proportion of workers in America. Experts in a variety of fields presented some pretty startling data. Jack VanDerhei, director of research at Employee Benefit Research Institute (EBRI), discussed the paradigm shift in retirement funding: employers have abandoned “defined benefit” programs, which offer a guaranteed monthly benefit that would ensure a secure retirement (and which cost companies billions because retirees are living longer). Instead, employees are offered “defined contribution” programs, through which they essentially fund their own retirement, with no guarantees. They set aside a certain amount each month, which is matched to some degree by the employer. The money is invested in stocks and bonds. If the investments do well, the employee might be OK. If the investment tanks (or the employee cannot put enough money in the account), there is virtually no prospect of a secure retirement. Guess what? Most of us are not setting enough aside. If you’re wondering where you stand, check out EBRI’s “choose to save” calculator (there’s a lot of useful information at this website). Here’s a hint: if you’re saving less than 15%, you’re probably not saving enough. And if you’re unfortunate enough to work in the lower quartile of the economy, and you are approaching retirement with very little in your retirement account, the projected required savings might actually exceed your total income! Yikes! Fortunately for the boomers, the labor market really needs their continued participation. Ed Vitalos, from IBM’s consulting arm, pointed out that there simply aren’t enough replacement workers ready to take on the jobs currently performed by (aging) boomers. In fact, there are already substantial shortfalls in a number of areas, including long haul trucking, engineering, mining, healthcare, government, aerospace and utilities. Because it takes time to train for these professions, employers are trying to incentivize current workers to stay on the job. They are offering very creative packages to accomplish this goal, including flex-time, creative benefit packages and work-from-home options. One company had the brilliant idea of offering scholarships for the grandchildren in return for the continued participation of their valued older workers. Steven Sass, from Boston College’s Center for Retirement Reseach, offered a sober assessment of the crisis facing many American workers. He anticipates cuts in social security, as fully one third of the population enters retirement. Because we are living longer, we have to work longer. Sass projects that working until age 70 is the most efficient way of overcoming a lack of savings prior to retirement. Sass’s solution is likely to work for white collar workers, but what happens to the blue collar worker, the tradesman, the factory worker, the driver, the utility worker? How well will their bodies hold up after a lifetime of wear and tear on the job? How can you be sure that they are able to perform physically demanding jobs safely ? Finally, what about the workers whose bodies succomb to the wear and tear of a lifetime – who cannot continue working and who have little or nothing saved for retirement? These folks have the prospect of living out their “golden years” in abject poverty. As we track the evolving issue of older and older workers, the Insider will focus its attention on the implications for workers comp. We know from prior blogs that older workers have fewer injuries, but when they get hurt, it takes longer for them to recover. We know that they are more prone to suffer from shoulder and repetitive motion injuries. We also know that the cost of treating an injured worker goes up with age. The Aging Workforce Summit has shown that many older workers lack retirement resources. They cannot stop working without plummeting into poverty. When you combine the injury and disability implications of an aging workforce with the economic necessity that drives worker behavior, you truly have a potentially toxic mix for workers comp system. Looking ahead, managers need to shift their focus onto the unique challenges of an aging workforce. The continuing participation in the labor market of older workers is basically both positive and necessary. At the same time, managers need to keep their eyes open to new and unprecedented risks as these valued people labor on past normal retirement age. Managers need to take proactive steps to ensure that workers comp does not become the default retirement program for employees who either are performing tasks they can no longer handle safely or for workers who happen to have no retirement funding at all. Yesterday, the Maine Supreme Court made a ruling in an interesting case related to the “going and coming” rule. It involved Justin Laliberte, an employee of VIP, Inc., who was returning from a weekend work project when his car veered off the highway and collided with another car, killing Nancy Spencer and injuring her husband and daughter. The Spencers are now suing VIP, Inc. and Laliberte for damages. Attorneys for VIP Inc have argued that, because this case was not work-related, Laliberte alone is the responsible party. Yesterday’s 3-2 ruling by the Supreme Court overturned a lower court ruling that the collision was not work related, thus upholding workers compensation for Laliberte and clearing the way for the Spencer’s lawsuit against VIP Inc.
Employees who work at one fixed location are generally not covered by workers compensation should an injury occur during the normal commute back and forth to work. Although state law varies, this going and coming rule generally holds true – but the devil is in the details, as they say. Every state has some exceptions to the going and coming rule, and one fairly common exception is when an employee is on a “special assignment.” In this case, the employee was performing a service for his employer’s company-related special event at an off-site location, and he was remunerated $25 and tee-shirt. Week of the Carnivals – we are a tad tardy in posting to last week’s great issue of Health Wonk Review, hosted over at Ezra Klein’s blog. For those of you who are unfamiliar with Ezra, he is a journalist and a regular commentator on health policy issues. His work has appeared in The LA Weekly, The Washington Monthly, and The LA Times, and he contributes regularly to Tapped, the blog of The American Prospect. Also, this week’s edition of Cavalcade of Risk is hot off the presses, hosted by Spencer Hill of Hill’s Personal Finance, a blog that’s well worth a visit in its own right. Ohio Watch – In the shadow of the Thomas Noe rare coin trial, which is well underway, we learn of a new criminal investigation underway involving the troubled Ohio Bureau of Workers Compensation – Toledo Blade reports that the special investigations unit and internal auditors at BWC are probing potential premium manipulation. Health and safety – As usual, there are many items worth your attention at Confined Space. Here are a few: Jordan reminds us that on average, two workers a day die in falls and how yesterday was no exception; tells us that popcorn lung is surfacing in Wisconsin; and in his provocatively titled post Who’s Sleeping with the Secretary of Labor, he examines the political influences on Elain Chao and how those influences affect miners and farm workers. Health care polls – Bob Vineyard at Insure Blog has posted about a survey of consumer attitudes on health care – with some surprising results. The post is generating a lively discussion in the comments section. Wellness initiatives – If you have any wellness fairs planned for your company, you may want to double check to ensure your wellness initiatives are not violating federal or state discrimination statutes, such as the ADA. A post by Tina Simson at HR Web Cafe informs us about the issue and tells us how the how the Department of Labor is issuing guidance for initiatives that may have a disparate impact on any group of employees. Carpal tunnel ruling – Roberto Ceniceros of Business Insurance reports on an Illinois Supreme Court ruling that overturned two lower courts in awarding compensation to a worker for a carpal tunnel injury. The judge said that the wind damage was covered “even if the wind damage occurred concurrently or in sequence with the excluded water damage.” He determined that most of the damage to the Leonards’ home in Pascagoula was the result of flooding, and thus Nationwide was not required to pay the full amount the Leonards were demanding. Nationwide had paid the Leonards $1,661.17 for wind damage. Judge Senter said that, because of what he determined to be additional wind damage, they were entitled to another $1,228.16. Whoopdeedo for the Leonards. The extra bucks will buy them a couple of appliances (assuming, of course, that have a home to put them in). By the way, Dickie Scrugg’s brother in law, Trent Lott (R- MISS), lost a $600K manse in the storm and is more than a little upset with State Farm for denying his claim. He’s taking on the entire industry in a personal, and potentially far-reaching vendetta. Jay Fletcher was Nationwide’s agent in the case. He had been selling insurance to the Leonards since 1989. The Leonards contended that Fletcher misled them by implying that their home-owners policy would cover water damage caused by storm surge. Paul Leonard claimed he got that impression during a conversation with Fletcher in 1999. The two met to discuss various matters, and the conversation got around to flood insurance. Leonard said the topic was on his mind because of public discussions concerning the lack of such coverage in homeowners policies, following Hurricane Georges in 1998. The agent’s inconsistency puzzled the judge, who couldn’t figure out why Fletcher discouraged some clients from buying flood insurance but went ahead and sold it to others—some quite near to the Leonards. But inconsistency is not necessarily negligence. NOTE to homeowners: push your agent for clarity. Write down the response. NOTE to agents: Be as clear as possible with your clients. If you’re not sure what to recommend, be clear in your uncertainty. In the post-Katrina era, we wonder whether the “standard of care” has changed – whether agents must now at least put the flood insurance option on the table, where appropriate. This close call in federal court should serve as a wake up call to agents. No, agents don’t need to recommend flood insurance to everyone. But you do need to be clear about what you recommend and why. If coverage is a borderline call, help your clients sort out the options. Throw in a few disclaimers. And unless you are supremely confident in your ability to sort through the ever-widening exposures confronting your clients, you might look into an errors and omissions policy. Consider that some friendly advice from the Insider (with our own disclaimer, of course, that we do not sell insurance, we do not endorse any insurance products and we are not responsible for the advice provided). Five years after the fall of the World Trade Center towers, there are lingering issues concerning the health of the rescuers. Over 40,000 workers rushed to the site in the immediate aftermath, and then sifted debris in the following weeks. It now appears that many of these workers have suffered lung damage, much of it permanent, some of it fatal. So who is responsible? Who pays? Not me, says the city. Not me, says the Port authority of New York. Not me, says the federal government. OSHA was just advising, they weren’t in charge. The city was following the feds. No, the feds were following Rudy Guiliani, braving the flying dust at ground zero for yet another photo op (and not wearing an unphotogenic respirator). : A single point of authority was needed. But the feds and locals bickered in a power struggle that led to many of the subsequent problems. : Once it was clear that there were no survivors, they could have closed the site to let the dust settle for a while. : Given the obvious toxic respiratory exposures, project leaders could have screened out workers who smoked or who suffered from pre-existing respiratory problems. According to Mark Hamblett, writing in the New York Law Journal, the judge ruled that it was too early in the litigation to determine whether the defendants are entitled to immunity under the New York State Defense Emergency Act (SDEA) or other immunity doctrines, including one claim that the federal government supervised key elements of health and safety conditions at the site and the Fresh Kills landfill. But as the “emergency condition fades,” he said, “the need for immunity diminishes and the obligations and duties otherwise imposed must be protected.” In other words, once we knew that there were no survivors, the health and well-being of the rescuers should have become paramount. The defendants said the Army Corps of Engineers had assumed control over the design and enforcement of health and safety monitoring at the Fresh Kills landfill on Staten Island, where debris from the site was taken and sorted. The Occupational Safety and Health Administration (OSHA) took the lead role in distributing respirators at Ground Zero and the Environmental Protection Agency took the lead on environmental monitoring and hazardous waste removal. So the Feds were in control? But at Fresh Kills, the judge said, the city “continued to exercise an independent degree of control over operations.” OSHA, he said, worked in an “advisory capacity, providing assistance only as needed and requested by the city. So the city was in control? Judge Hellerstein notes that while the defendants developed “a viable health and safety plan for workers at the site,” the pleadings show there were “critical lapses in the enforcement of safety standards and in the dissemination of vital information about the safety of the air at Ground Zero to those most affected, the workers themselves.” As Rousmaniere notes, the safety play book was carefully drafted and then stuck in a bookcase, collecting (non-toxic) dust. In any event, I find it hard to focus on the nominal leaders who jockey for position in the klieg lights following a disaster. It’s just too hard to separate the self-promotion from the public good. My thoughts are with the dedicated and truly selfless people who offer their services in a time of emergency. They are not thinking about the future. They are not worried about political capital. They are simply trying to help. It is ironic and surely a symptom of our times that in the aftermath of 9/11 we have given notice to any such responders: think twice about rushing into the inferno. You may well be on your own for any health problems emerging from your work. The very people who urged you to participate are running away from your pain as fast as they can. The rhetoric has gone from “I’m in charge” to “you can’t blame me.” They have plenty of justification for their hold harmless/immunity arguments, but surely that does not mean that no harm has been done. The Insider is partial to actuary jokes. Perhaps it’s because so much depends upon the actuarial viewpoint. These are the people who drive the insurance bus. Those of us seated in the bus often feel a bit queasy, as the driver has the vehicle pointed backwards and attempts to drive while looking through the rear view mirror. They drive in this hazardous manner, because historical losses are the primary predictor of future losses. Well, sort of. The comp industry is confronted with many issues relating to an aging workforce – including the fundamental fact that many people are postponing retirement: some won’t retire because they like working, while many more plan to keep working because they have to. As people work longer, we will begin to see more claims activity in the higher age groups: people in their 60’s, 70’s and even 80’s will suffer work-related injuries and, despite their ages, will file comp claims. Comp administrators in each state will be confronted with new issues as these claims wend their way through the system. I have no idea how actuaries will go about factoring in the new and largely unprecedented risks of an aging workforce into the calculation of premiums. We can only wish them luck – and perhaps, have a little fun at their expense. While the Insider would never cast aspersions toward the work of actuaries, we think it appropriate to let them make fun of themselves. Here’s a little sample of their self-deprecating humor, compiled by Jerry Tuttle. Based on these examples, actuaries may be having a better time than the rest of us have been led to believe. How do you get an actuary to laugh on a Thursday? Tell him or her a joke on a Monday. Workers compensation fatality benefits are generally payable to the surviving spouse until death or remarriage, so remarriage is the actuarial equivalent of death. An actuary is someone who expects everyone to be dead on time. Two actuaries are duck hunting. They see a duck in the air and they both shoot. The first actuary’s shot is 20 feet wide to the left. The second actuary’s shot is 20 feet wide to the right. The actuaries give each other high fives, because on average they shot the duck. Here’s wishing the best of luck (and solid projecting) to the actuaries in their rear-view oriented look toward the future. And good luck to the rest of us, who must live with the consequences of their work! Major California study of low wage immigrant workers – Peter Rousmaniere of Working Immigrants brings us the important study Barriers to Occupational Health Services for Low-Wage Workers in California. The study deals with the 3.7 million Californians are employed in occupations whose median wage is less than $10 an hour and the estimated 2 million in the underground economy. The majority of low-wage workers are nonwhite and immigrants. The workers studied include food service workers, health aides, hotel workers, assemblers, agricultural workers, retail workers, sewing machine operators, and others. Lip service – Jordan Barab of Confined Space takes OSHA (and many of us in the industry) to task for being masters of the obvious in calling for “Prevention” and “Safety Pays,” but falling down on the job when it comes to the enforcement tools that make a difference. Drug Free Work Week – HR Web Cafe tells us that this week is Drug Free Work Week and presents links to a variety of resources for building a drug-free workplace program. Direct contracting – Joe Paduda at Managed Care Matters takes on the question of when and under what circumstances it makes sense for employers to contract directly with health care providers. Notes on PA law – We haven’t linked to Judge Robert Vonada’s Pennsylvania Workers Comp Journal (PAWC) in some time. The good judge has some recent updates of court decisions – one, a case of a claimant who sought a reinstatement of benefits after the statute of limitations and one decision that highlights the importance of specificity in Supplemental Agreements. Tail wagging the dog? – Michael Fitzgibbon of Thoughts from a Management Lawyer points us to Novia Scotia court of appeal case that dealt with whether a wrongful dismissal could be an “accident” for workers’ comp purposes. Now’s your chance to comment on actuaries – Alberto Dominguez of What’s an Actuary points us to a draft study entitled Critical Review of the U.S. Actuarial Profession, which identifies risks and opportunities facing the profession and makes recommendations for addressing them. If you are an actuary, a regulator, or a direct or indirect user of actuarial services, you have until December to comment on the draft report. For your Friday reading, we offer you the most recent edition of Cavalcade of Risk, which is hosted at Wisdom from Wenchypoo. There’s a good smorgasbord of posts ranging from insurance and health-care related items to economics and finance. We particularly liked this post on Risk Management & Insurance from the Specialty Insurance Blog – a discussion of the trend towards alternative risk mechanisms. Is good hearing an essential job requirement for drivers of UPS trucks? UPS thinks it is. They categorically disqualified from driving any applicant with a severe hearing disability. They say it’s a safety issue. We read in the LA Times, in an article by Lisa Girion, that UPS failed to win the safety argument in court. The San Francisco-based U.S. 9th Circuit Court of Appeals ruled Tuesday that UPS illegally discriminated against hundreds of deaf employees and applicants by barring them from driving delivery vans. As is so often the case, UPS ran into trouble by establishing an across-the-board exclusion of drivers with hearing problems. In the world of disability, you just cannot lump everyone together. You have to take it one disabled applicant at a time. “If you want to use a physical criteria to exclude a whole class of people from a job, you need to be able to prove that substantially all the people with that criteria can’t do the job safely,” said Lawrence Gartner, a partner with Baker & Hostetler in Los Angeles who represents management in employment law cases. The ADA requires highly individualized findings. UPS dispensed with any individual analysis of a given deaf applicant’s qualifications for the job. Employers need to review their hiring policies and job requirements to make sure none of them exclude broad groups of people without just cause. Companies that fail to take such steps could find themselves vulnerable to similar suits from disabled employees. In its decision, the court upheld a 2004 lower-court ruling that the parcel delivery company’s policy of denying driving jobs to hearing-impaired employees violated the Americans with Disabilities Act. The fact that other delivery companies routinely use deaf drivers made the UPS categorical exclusion pretty difficult to justify. Joe Beachboard (who joins the ranks of my favorite names of attorneys practicing in California) says the ruling puts employers in a “damned if they do and damned if they don’t” situation. If UPS doesn’t employ deaf workers as drivers, it can be sued under the disability act, he said. But if a deaf UPS driver has a serious accident, the company also could be sued. Well, maybe. I think that UPS will be on solid ground when they put hearing impaired drivers in their trucks. With all the distractions surrounding those of us who can hear and drive at the same time (cell phones, books on tape, CDs, Ipods), one can hardly argue that we are really in tune to the chaos that surrounds us on the roads of America. I imagine that for the most part, UPS’s hearing impaired employees will do a better job of focusing on their driving than the rest of us. In an effort to control skyrocketing medical costs, many employers are now providing on-site access to primary medical care. A recent article on workplace medical clinics in the Orlando Sentinel discusses the national trend and how it is in evidence in central Florida. Typically, on-site clinics have been confined to both occupational medicine – treating and preventing work injuries – and to larger employers. That may be changing. Today, some health service providers are targeting smaller employers, with a half day on-site medical services provided at a rate of about a half day per every 150 employees. Employers that implement clinics are generally motivated by the potential to manage costs, but as the number of uninsured workers continues to increase and the working population continues to age, keeping the work force well may become an increasingly important issue. On-site clinics can also enhance productivity since since employees don’t have to take the time from work for off-site appointments. In addition, medical care can be a powerful benefit and differentiator for employers, bolstering both recruitment and retention. “That type of program design also proved effective for Power Flame Inc., a 187-employee manufacturer of gas and oil burners in Parsons, Kan. Before adopting on-site care, Power Flame’s health insurance costs were about double the national average and were rising at a double-digit rate annually, chiefly because of catastrophic claims. 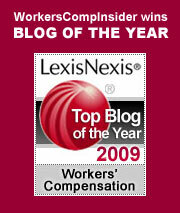 The implications for workers comp are many. Medical cost containment is the most obvious. A generally healthier work force means fewer injuries and faster recovery for injuries that do occur. Immediacy and proximity of care are also greatly beneficial to treat any on-the-job injuries. And the advantage of having a doctor who understands the workplace and the nature of work is also invaluable in terms of establishing effective return-to-work programs. Of course, cornerstones of any in-house programs must be quality and integrity The term “company doc” has historically had a very bad associations as being too aligned with the employer’s and not the employee’s interest. We’ll keep our eye out for more stories on this topic. It would seem likely that we will see an upsurge in “doc in a box” type clinic arrangements being made available to smaller employers.